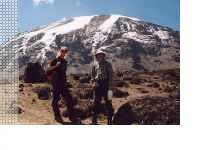 Father and son, Keith and Jonathon Roberts, recently completed a successful trek to the summit of Mount Kilimanjaro in Tanzania, raising around £3,000 for charities in the process. Thanks to all companies, especially QAS, and individuals for their sponsorship. The British Heart Foundation, Diabetes UK and the National Asthma Campaign have benefited from the money raised. The trip was organised by Gane and Marshall who we can thoroughly recommend. For more details, click for feature article on the Barford Community website, which is managed by Wordfair as a free service to a local village community.